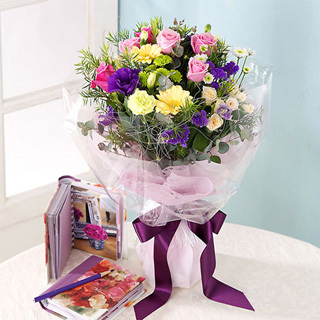 Fresh flowers in shades of deep purple and yellow are gathered up and presented in the ultimate floral gift. This blended rose, carnation and seasonal flower bouquet is matched with well on every occasion like anniversary and congratulations. 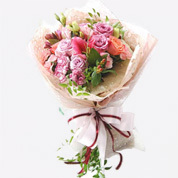 To ensure that the flowers will last longer, they are shipped fresh, budding and ready to bloom. Order by 4:00 p.m. Monday to Saturday or 11:00 a.m. Sunday in Korean time zone(GMT+9), and your flowers will be hand-delivered that same day! We offer FREE personal message card and ribbon services. The card(ribbon) message is written with hand script in English, Korean, Chinese and Japanese and attached on the product. There is no additional service charges. The price is compised of shipping cost, taxes, message card(ribbon) and delivery confirmation fees. Our online payment gateway company AEGIS HYOSUNG Inc. will be marked on the receipt. You can print out the credit card receipt by clicking Inquiring about the Account of Creditcard Expense. If you want to know more about detailed information about credit card payment and remitting on our bank account, click [ How to pay ]. We can ship to any address in Korea on the same day without exception on holiday. Note that every items has their own delivery period in light green box on right of the item photo. You can specify arrival date and time except some busier seasons. Adding or modifing option of items needs 2~3 hours more. Normal delivery hours for a florist are between 9AM and 7PM. We will let you know by sending confirmation e-mail after the delivery finished. And if you have the number of order, you can track your package by clicking the "track order" tab.